I have had many requests for details on how I built the theater, with many of those requests about the subwoofers in the floor. I didn't take too many pictures while building it, but I did find these snapshots. Not the best photography, but I hope better than nothing. Take the time to bring up the pictures as I have added text to some of them pointing out some of the details. Here is a copy of the original sketch I made where the elevation of the speakers, screen, platform and chairs was decided in order to ensure a good view of the screen from the rear row of chairs. At this time the projector location was not decided. You can also see the Triad THX side speaker location. 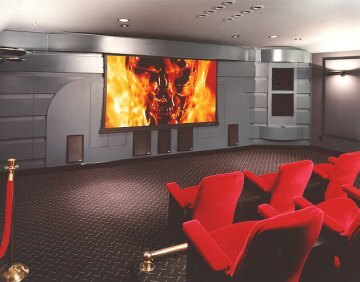 This picture is taken from the right rear of the room showing the platform that the rear row of theater chairs is mounted on. Inside of it you can see the location of the two 12" subwoofers that have enclosures below the floor between the floor joists. The subwoofers are mounted in a channel that goes fully across the platform, out each end and into the front center of the room. This picture is taken from the right front of the room, looking back at the platform. You can see the front row theater chair supports, and the exit opening for the platform subwoofers. This shows the actual sub enclosures just prior to the tops being sealed and attached. You can see the insulation inside them as well as the 4" ports that are attached to the tops. This a picture of the front of the finished platform with the floor installed. Here you can see the exit opening at the front of the platform for the subwoofers. This is a picture of the finished platform right end showing the exit opening for the subwoofers. This is the front cabinet under construction. It is built from 3/4" birch veneer plywood and has many, many coats of paint on it. This is the ceiling subwoofer under construction in the attic. It has two Petras 18" subs in it and ports into the room via eight 4" PVC pipes. The enclosure is made from 1-1/4" MDF particle board. It is designed to straddle two of the ceiling joists. I assembled it in the attic not only because it was too big to carry it up the stairs, but because it weighed a ton. This is a view of the huge subs mounted in the internal baffle.